Why is washing machine leaking? It may happen due to a number of reasons and each particular situation requires certain methods of repair. Carefully inspect water supply hose for any damages. If it is not visually possible to determine whether it is leaking or not, disconnect it from the machine, put a plug on the lower end, and then wrap the hose with a toilet paper. Once you open the water tab, it will instantly indicate where the leakage comes from. If this is where the hose connects to the tee in the water supply system or where it connects to the appliance itself, then you might need to replace the gasket. If the leakage comes from the hose itself, it must be replaced. The simplest cause is a filter cap which was not screwed well enough after a routine inspection or cleaning. As a result, water comes out from the bottom of a washer during operation. The solution is very simple: you need to tighten all the fasteners. water pressure in the plumbing system is too strong. Water begins to spill over the edges of the device: this is how washing machine leakage occurs and it is not difficult to fix that problem at all. All it takes is to remove the dispenser, rinse the mesh and the walls of the drawer under tap water and then put it back and turn on the water again. This is a typical problem for many household appliances – the unit itself might be reliable in operation, but the manufacturers of its connecting pipes supply low-quality goods. As a result, your washing machine starts to leak because of some leaky part. If a leakage appears in the lower part of the appliance during water intake and then it stops – the problem is in the damaged pipe connecting the filling valve to the dispenser or the one that fills the drum with water. Another similar connection goes from the drum to the drain pump. If this pipe has any sort of cracks, then you will see water pools on the floor after draining or spinning. Washing machine door has a seal made of elastic and dense rubber, which seals the drum once you close the door and start the wash. If you notice a leakage coming from under the front side of the machine, then most likely there is a crack in the door seal. This can happen because of improper door closing, as a result of a rubber break, or because of regular wear and tear. 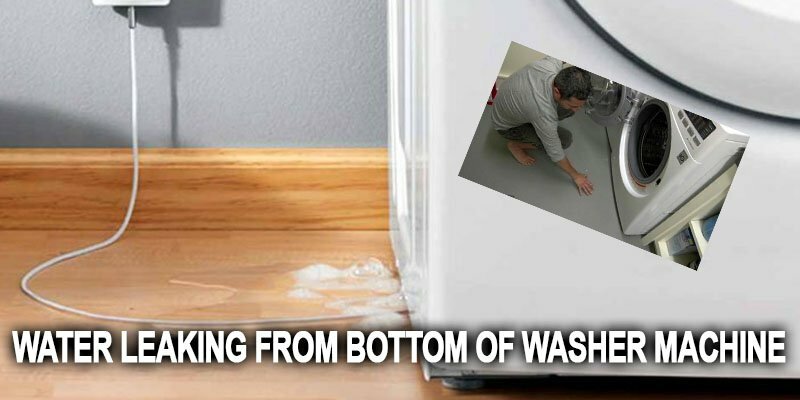 If water starts to come out from the bottom of your washing machine during filling or washing, then this is a sure sign that the inner part of the rubber seal is damaged. The leakage may also occur because of drain pump malfunctions. The experience shows that in most cases the effective solution of this problem requires the replacement of the pump itself. Washing machine drum is a very robust and durable element. It might seem that it definitely should not leak, but reality proves different: sometimes washing machines leak exactly because of this part. Some sharp items may accidently get into the drum with laundry, which may cause cracks or holes in the drum. Sometimes the seal responsible for tightness may be damaged during spinning – it will lead to leakages. Another quite rare cause has to do with drum overload – the excess water simply leaks out.